To read about other Tuscan destination click here. Included All breakfasts, three dinners, one Florence cooking lesson, wine tasting, one lunch, one airport transfers, guided tours of Florence and Lucca. Hotel First class heritage property. Want to stay longer? Additional nights at Il Paradisino available upon request and based on availability. Additional nights in Tuscany 180 Euros per night including breakfast. *Due to recent fluctuations in currency, this trip is priced in Euros. Join one of our groups or ask about personalizing this trip for your preferred departure dates. Upgraded rooms available upon request. We recommend this trip on its own or as an add on to any Italy holiday. We can extend the tour to include more cooking, the Tuscan countryside, Rome, and so much more. For an intelligently crafted and passionately planned trip, travel with EVIA. Whether you wish to visit the birthplace of the Renaissance, explore the arts, or want to see for yourself the rolling hills, endless vineyards and stone-built towns, Tuscany is a necessary part of your cultural education just as it has been for centuries. Group and Custom Departure dates available. October 9, 2017 & April 11, 2018. 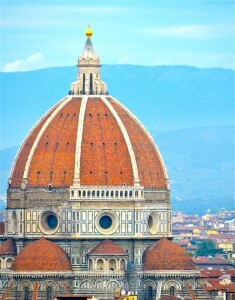 This Florence cooking holiday adventure is priced based on a minimum group size of 4 participants or more. Join our group departure or have our concierge service plan a trip based on your dates of travel. If you are a private group wanting to modify the itinerary, change the hotels, or travel with larger or smaller groups, prices will be provided based upon request. What makes our trips special? We do all the work. All you have to do is pack. NEXT GROUP DEPARTURE: April 10, 2016. April 29, 2016. The morning begins at 11:00 a.m with a walking tour like no other. Francesca will show you the highlights and take you around areas known only locals. There is ample time in the afternoon to walk around on your own, visit the museums, stop at the San Lorenzo market, or take in some Italian shopping. For dinner, we can make dinner reservations for you in Florence or we can arrange a transfer back to Il Paradisino in the late afternoon to unpack your bags, relax in our gardens, take in the unique surroundings. The evening begins with a welcome drink and some time to chat and get acquainted. Then, the first of many true Tuscan feasts begins. Depending on the weather, you will either have dinner in the Renaissance villa tasting true Tuscan family recipes that have been handed down for generations. Or, if the evening is warm, Chef Costanza and her family prepare a pizza marathon. This involves baking 9 different fresh pizz as in the outdoor oven. You’ll learn how to make the perfect pizza dough and select both classic and modern toppings, including fresh vegetables from the organic garden and cheese from nearby farms. Some are topped with freshly sliced samulmi (not salami) and scrumptious cheeses. The slow food movement is alive and well in our Florence garden. There is no rush and eating Italian style affords an amazing opportunity to eat, drink, talk, and enjoy! Wake up to a glorious breakfast served in the garden (weather permitting). Our fresh-brewed coffee, breads, homemade jams and other delicacies will awaken any palate. We then whisk you out of the city to visit the Tuscan country side with spectacular vistas, amazing history, and superb wines. We will return to the Villa with enough time for an experience of a lifetime – cooking true Tuscan food. We start with a tour of the organic herb garden and an introduction to organic farming to learn about choosing the right herb for each dish.. As part of our garden tour we will point out the trees, vegetable gardens and introduce you to our agricultural methods. After this, we take you in to main Villa, Chef Costanza’s family home since the XVIII century. The exquisite and large kitchen has been modified so that everyone can participate in cooking the 5-course meal using only Florentine family recipes complimented with fresh organic ingredients from the garden or from local markets. It takes about 3 to 4 hours to prepare and cook appetizers, make fresh pasta and sauces, the main meat dish (fish and vegetarian options available upon request) and of course to prepare desert. After cooking your first true Tuscan meal, using modernized family recipes handed down for generations, you will be sent out to the colorful garden to clear your mind and senses of all kitchen smells. Of course this is done in a most civilized manner. With a glass of processco. According to chef Costanzna, our palate for tasting is heightened when we start by clearing our senses of all the kitchen smells. While you are relaxing an elegant table is being set for you inside the villa. You will dine like royalty on original furniture from the XIX century. You will be invited to sit down at this elegant setting where dinner will be served to you. In true Tuscan style dinner will be accompanied with wine. Dinner is based on seasonal produce. Please let us know if you have allergies or foods that you do not eat. Each Florence cooking class includes 1 appetizer, 1 first course, a second course with 2 side dishes (called contorni) and 1 dessert. Included beverages are 1 glass of prosecco, ½ bottle of wine per person, coffee. Chef Costanza says: “At Il Paradisino, we are very passionate in our teaching and it is our mission to make sure that you return home with the knowledge of how to prepare meals with Tuscan flavor.” Dream it and we will make it happen. According to Tim Jenson of the London Telegraph, Lucca is “cultured, peaceful, and urbane – Tuscany’s best kept secret.” Today you will find out for yourself as we take you to the historic medieval city of Lucca. 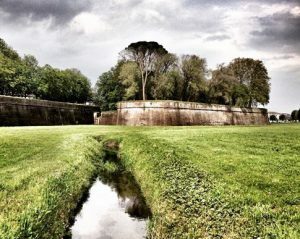 There will be time to walk along the rampart walls, one of the most intact medieval wall structures in Italy. Lucca is a completely flat city, making it ideal for light walking or for renting a bicycle to tour around. Our walk inludes San Paolino Street, where we’ll see the home where Puccini was born (exterior only), the dazzling church of San Michele with its wedding-cake façade, and the imposing Piazza Napoleone and nearby Piazza del Giglio, Lucca’s architecture makes it a perfect outdoor museum and this charming city is also a little shopping paradise. After our visit to Lucca it’s time to try some authentic Tuscan wine in a small carefully selected vineyard in Carmigiano. Time permitting we will visit the Medici Villa of Poggio a Caiano and the museum of Still life. On the way back to Il Paradisino we will stop at a typical trattorie for dinner. Dinner not included in pricing. After breakfast we leave Il Paradisino for the Tuscany countryside. 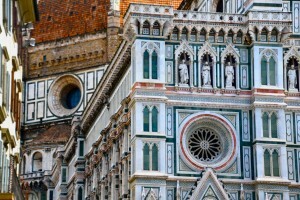 The 4-day adventure ends here with a transfer to the airport or train station in Florence. 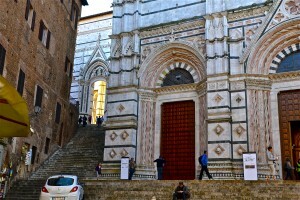 The 7-day adventure continues with guided tours of Medieval Siena followed by a jaunt to San Gimignano. Siena is a Tuscan hill-city like no other. If you were to choose only one area of Tuscany to visit, Siena would be the place. This UNESCO World Heritage site, settled by the Etruscans in 900-400 BC, is located in hilly central Tuscany. If Tuscany is known for encapsulating the very essence of Italy with its charming medieval towns, vineyards, and exceptional food; then Siena is known for being the essence of Tuscany.This town’s tumultuous history results in an amazing experience for today’s traveller – from the era of Roman rule, Byzantine raids, and Lombard and Frankish occupation. You’ll experience it all by visiting the ancient fortresses, abbeys, and cathedrals. The town is still famous for the Palio horse race on July 2 and August 16, running since 1656. You may have seen the event in the opening of the James Bond film Quantum of Solace. Our accommodations for the next 3 nights will be in San Quirico or Montepulciano depending on the time of year (B, D). This morning we head out to Renaissance Pienza, still a very active town in the heart of Tuscany. Pienza is world renowned for it’s Pecornio (sheep) cheese and picturesque views. We continue to Bagno Vignoni, hot springs enjoyed by the once ruling Medici Family. Lunch will be at one of our fave secret spots. Accommodations: Palazzo del Captino – or equivalent (B, L). Montalcinio is the seat of the best Tuscan wines called the Burnello wines. Our tour includes a wine tasting and guided walk in the medieval village. Tonight we share our stories during a farewell dinner (B, D). All things must come to an end. After breakfast we say our good-byes to this amazing Florence Culture and Cooking Holiday. Whether you are returning home, or continuing on to other parts of Italy, or joining us for a jaunt into the countryside, our concierge service is happy to help you get to your next destination. Accommodations: Palazzo del Captino – or equivalent (B). Airport transfer from Florence airport to Il Paradisino, 5-day trip: 4 nights hotel accommodations with breakfasts, 3 dinners. 7-day trip: 7 nights hotel accommodations with breakfast, 5 dinners, 1 lunch. On both trips 1 dinner is a Florence cooking class that takes about 5 hours, wine tasting, cheese tasting, pizza marathon dinner, guided visit to Florence, guided visit to Lucca, luxurious gardens for you to explore. Romantically appointed accommodations in keeping with the Renaissance Tuscan traditions. The extended trip of 7 days includes 3 additional nights in the heart of Tuscany with tours of Pienza, Montalcino, San Quirico, Siena and San Gimignano. Flights, insurance, tips and gratuities for guides, alcohol and drinks unless specifically mentioned as included, pre and post travel arrangements, personal purchases, lunches.